Kumfer Family Dental (Greenwood) - Book Appointment Online! 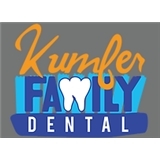 Kumfer Family Dental is a locally owned and operated dental practice in Greenwood, Indiana. We take pride in providing quality dental services to patients of all ages. We believe that good overall health, starts with good oral health and we focus on patient education as much as patient treatment. Had not been to the dentist for quite awhile. Dr Kumfer and his staff were great and I would highy recommend to anyone.